Pescara Central station parking offers you alternative parking options that are secure, reliable and cheap. Due to the location of Pescara central station parking you can reach the station in just a couple of minutes. With Pescara Central station parking, you can make a reservation for either covered or uncovered parking space for cars, motorbikes and vans. To check prices and availability for Pescara Central station parking, just enter your dates and times of interest in our search engine!You will pay the full amount on your arrival at the car park. 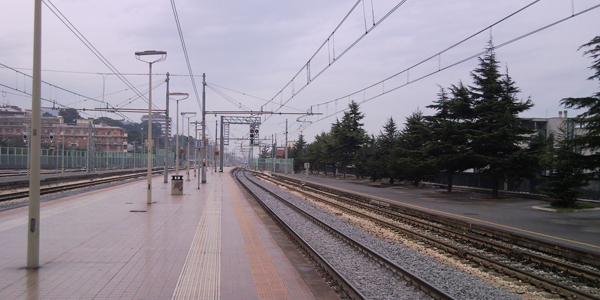 Pescara central station is the main train station of Pescara city, on the Adriatic line. The station serves an average of 3.5 million people a year and is located in the city centre. The main entrance to the station is from Piazzale della Republica, located near the bus station. The commercial area of the passenger building is managed by CentoStazioni, while the facilities and rail infrastructure are the responsibility of the Italian Railway Network (RFI).